Hello tribe! Are you looking for a simple and easy way to do manual pinning? Do you want to be able to pin from your smartphone or tablet ‘on the go’? Do you need a system that you can start and stop as time permits? I’ve got just the thing for you. Welcome to my review of my new favorite manual pinning method, Manual Pinning Simplified which is $39. I will give this a 5/5 for ease of use. And 5/5 for the improvements to my Pinterest account, and by extension, my website. Who created manual pinning simplified? Kyla Sims is a Pinterest strategist who created Manual Pinning Simplified after not finding satisfaction with the other manual pinning systems that she had tried. 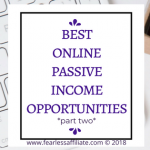 Kyla has created massive success in just a few years with her website, Dish It Out Social, using Pinterest, and now teaches others how to do the same. I admit that I hesitated to try this system because I had already tried a couple of manual pinning strategies/ideas and was not too keen on the whole spread sheet tracking aspect. I was hoping for something simple and easy to set up, because who has time? Kyla’s system is very clear that this can be done with a smartphone and does not require spreadsheets or tracking software, so I thought what the heck. I am happy that I did! This is a super easy system to learn. You can do it while you stand in line or in a waiting room, while you are cooking dinner, or whenever you have a couple of minutes to pin. Manual Pinning Simplified is just that…simple, manual pinning. It is easy to figure out where you left off, so you can be pinning at odd times over the whole day, which Pinterest luuurrrvvvs. Why use manual pinning simplified? Prior to these new manual pinning books and courses, people did their manual pinning their own way and kept track their own way, usually using some kind of spreadsheet like Google docs or Excel. Many people choose to manually pin to save money on schedulers, which is especially helpful if you are just starting out, or if you are blogging part time and not earning much from your blog yet. One of the issues that caused an upswing in manual pinning in 2018 was the loss of the pin scheduler Boardbooster (RIP). What is the boardbooster scheduler? Boardbooster was an affordable tool with a set-it-and-forget it interface that made scheduled pinning super easy. However it was not an approved partner. A lot of people were bummed by the loss of Boardbooster and not ready to have to re-learn a new tool (show of hands? ), so the timing was perfect for the manual pinning strategy books and courses to have a surge in popularity. When I started using this system, I decided to time-block 3 chunks of time to manual pin. I set up my Google calendar and I set an alarm on my phone, just to get into the habit. 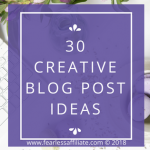 It only takes a few minutes to pin and I can move on with the rest of my blogging day. You do not want to mass-pin into Pinterest. 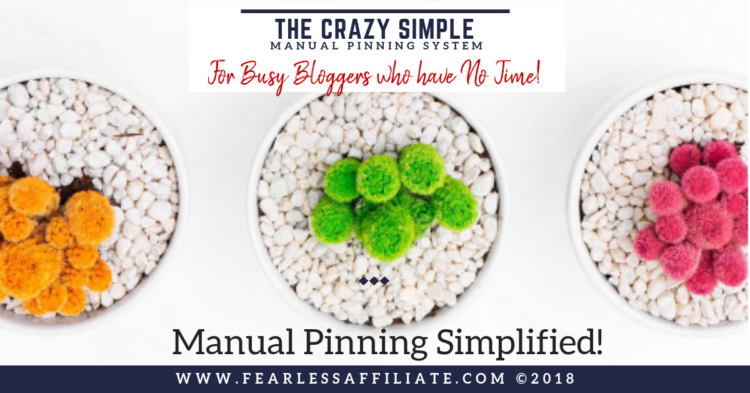 If you do not have much time during the day to pin, try this manual pinning system rather than trying to do all of your pinning work at one time – which causes Pinterest to think that you are a spammer. Some people have amazing success with manual pinning. Other people swear that using a scheduler is the only way to go. Many bloggers use both, as do I. This manual pinning system is much faster than scheduling pins! I opted to put all my boards in alphabetical order. This has them in the same order that you will find your pins on mobile. This makes it easy to figure out where you left off if you are pinning while out and about. And I am also going to say that I believe that tweaking my manual pinning this way has helped me recover from my Pinterest nosedive that was happening over summer, while I was using only a scheduler. I will be explaining all of this in my next post, so watch for that. If you do not have a strategy in place yet or you want a boost to your scheduling work, try Manual Pinning Simplified. 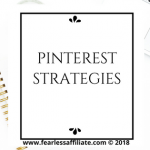 When I first started using Pinterest, I only used manual pinning (I did not know that scheduling tools were an option), and my stats went crazy. I was shocked. When I added in Boardbooster, it went nuts. 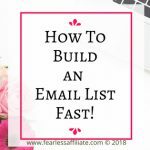 I had set up email marketing to capture visitors and I had 28 in one week. Yes, from pinning. I thought all those people talking up Pinterest and how great it is for traffic were out of their minds, but I was so wrong. This also proves that daily pinning is rewarded. The other benefit to the Pinterest views was that I was getting more page views on my blog, which is why we do all of this stuff anyway. 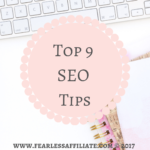 You need to have a Pinterest for business account with an optimized, keyword-rich “bio”, Rich Pins, and an optimized profile bio, with keywords if possible. You need to have 10 to 15 relevant boards that relate to your niche. And you need some group boards as well. The people in the group boards will be sharing out your pins, which gives you a level of reach that you cannot get on your own in the beginning. You will also need a notebook or a way to keep track of which pin you are pinning each day, so that you are not spamming group boards, but this is still easier than using a spreadsheet! Kyla also has a section on the easiest way to find group boards! You do not have to join 40 in one day; just add in the ones that accept you and start watching your Pinterest analytics every time you join a new board. Fair warning. It does take time to see results from changing things on Pinterest. Joining a couple of new boards in one day will not skyrocket your views by the next day. Give it at least 3 to 4 weeks to monitor changes before tweaking again. Need help with creating pins? 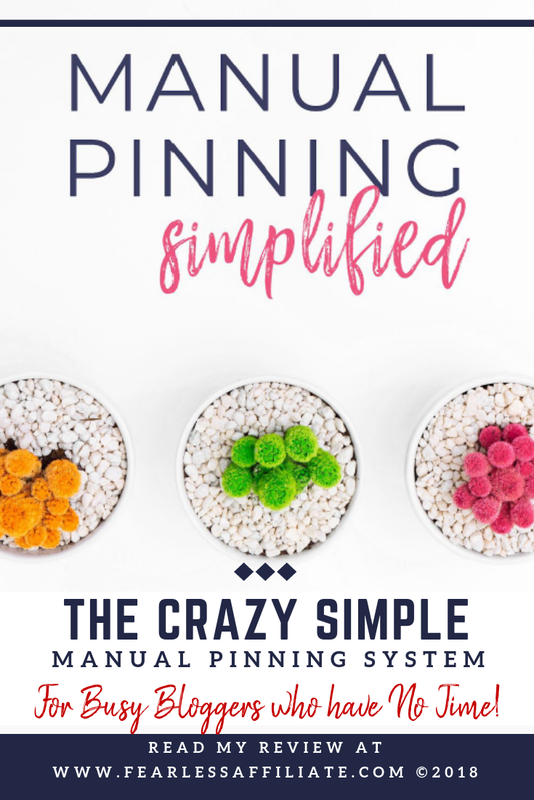 Manual Pinning Simplified will give you the correct and updated information on what works best on Pinterest these days for the size of pins, and how to optimize them, in the course. Kyla also has a FREE 5 day Better Pins Challenge. You can sign up on her website Dish It Out Social. The sign up form is at the bottom of the post. 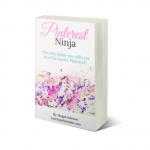 Let Kyla help you create stylish and click-worthy pins to help your success. I have thoroughly enjoyed learning the Manual Pinning Simplified system. It is a huge time saver and has improved all of my stats since I started implementing it. You will probably be like me and wonder how you were doing things before especially if your stats are lagging. Or worse, they have stalled. I know that well, and I am here to tell you that you can recover! I hope that this post has helped you and that you will share it with others. Sharing is caring! 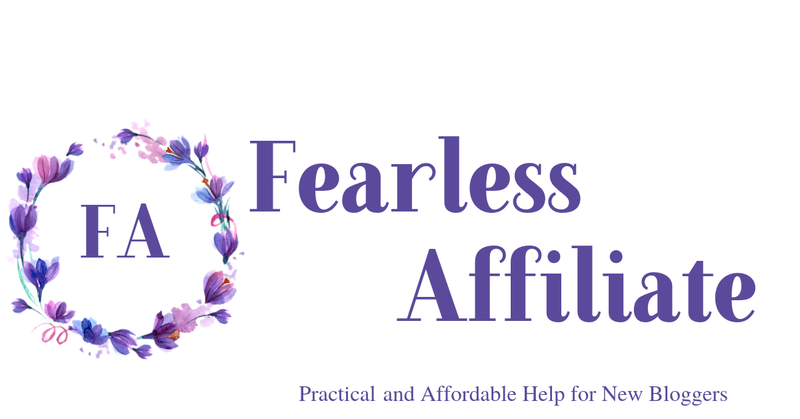 And be sure to sign up for my newsletter of deals, freebies, and tips for affiliate bloggers. Until next time, happy pinning and follow me on Pinterest! As a new blogger, this is an eye opener for sure! I am just now getting into the world of online blogging and honestly knew nothing about what you mentioned here. I’m glad to have found this because time is always against me and being able to utilize time efficiently is so important. I will check out the system you recommended and see if it works for me 🙂 Thanks for this and other helpful posts! You are welcome Mutsumi and thank you for visiting us today! Wow! Finally pinning made easy and simple. Well not only that it saves us time and energy in figuring out pinterest, it gives us more time multi- tasking or we can devote the rest of the day doing other chores. Like you said, who has the time? Everybody’s busy in this fast-paced world. I think this is the solution and this is what everybody needs. Thank you for sharing to us. Hi Joyce and thank you for visiting today! I agree! And it has saved me a ton of time once I got a system in place to pin during specific time periods (what works for me and my life). This is very interesting! For I’m trying out Pinterest myself. I haven’t got any Tailwind, or joined Group Boards. What I’m doing now, is manual pinnning— literally! I observed great change on my Pinterest analytics but not so much on my site’s. Maybe I still don’t get it. What is the difference between the Tailwind and the Manual Pinning Simplified? One thing that I don’t understand is– How will it help me to get traffic on my site/blog, if I am actually pinning other people’s pin? because that pin leads to someone else’s blog. Thanks Irma and I’ll come back for answers. Hi Mina and welcome back! It does take a while for pins to get noticed on Pinterest. Make sure that all of your pins have a call to action encouraging people to visit your site for more information. Even just putting the words “Click here to read more” can help. You will start to notice the increase in traffic after a few weeks of using it daily. If you screenshot your Google Analytics, you will start to notice the traffic coming in from Pinterest. Many blog posts that I have read say 85 to 95% of their traffic is coming from Pinterest. 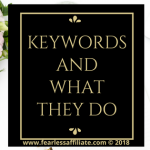 You can find this in GA at Acquisition > All Referrals > Channels and click on Pinterest to see which pins are bringing traffic. 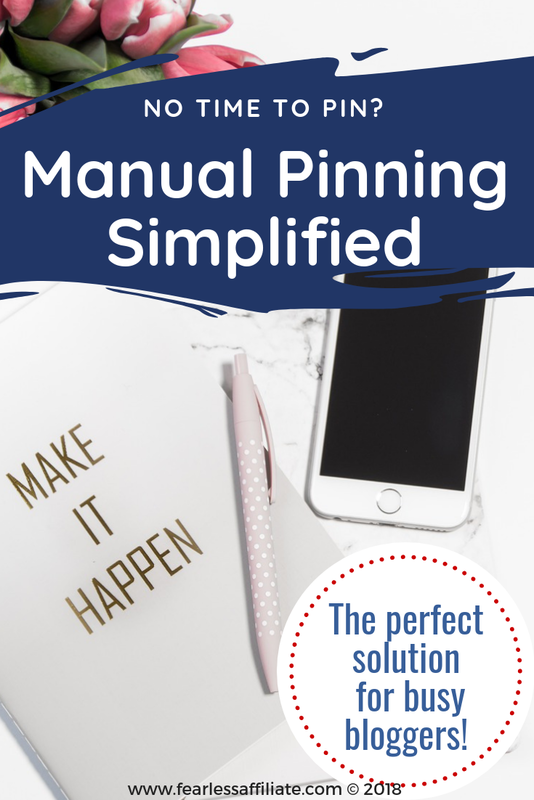 Manual Pinning Simplified is an ecourse on how to strategically pin manually on Pinterest. Tailwind is a scheduling tool that you can use to automatically pin for you. This is a yearly subscription service (you can pay monthly but it is more expensive that way). I recommend that you manually pin, either using a course or just “doing it” for a couple of months until you have joined some group boards and have more pins in your profile. Then when manually pinning is too much work, bring in Tailwind to do most of the work for you and then just manually pin about 25% during the day. The increase in people seeing your pins will drive the traffic to your website. Be sure to have email marketing set up to capture subscribers! 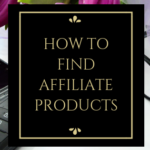 Hi Irma, I am new to affiliate marketing and am still looking on how to use pinterest to my advantage. This system seem to to help me make things a lot easier from the beginning. It really is. You can stick with this system for many months before you feel the need for a scheduling tool. Just keep building up your Pinterest profile and move to a scheduling tool when it becomes too much work. I have to admit that I have a long history of not caring about Pinterest. I joined years ago with a friend, and we had a blast looking around for a day and I never went back. But I recently rejoined Pinterest for my website even though I grumbled about it for a while. I was floored at how much traffic my website had from my Pinterest. I think I still have a lot to learn about it, but I was impressed. I’ll be putting a lot more work into my account this time. You know once you get on a roll with Pinterest the maintenance goes way down. 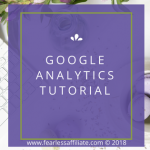 After you pick a pin template or two and get used to using Canva, manual pinning is just something that you pencil in two or three times a day, and then watch your analytics to tweak what you are doing. I love, love, love getting traffic this way! This is a great post for someone like me who, I’m sad to say, hasn’t even setup a Pinterest account for my site. It’s always been confusing as to what pins were used for in the first place and you’ve taken a lot of time to explain it to the point that I feel confident enough to give this a try. Do you personally prefer manual pinning? If so, why? Hi Aria and welcome back! When I first started, I thought that I had enough to learn without adding in learning to use a scheduling tool on top of it. I manually pinned for the first couple of months and it was no problem. I had very few group boards at the time, so it only took a few minutes daily. Now I am pinning one pin from each of my 30+ group boards daily, and it would be no trouble to pin two or three pins because it only takes me a few minutes. You do not want to be pinning more than 50 pins per day according to Pinterest, otherwise they think you are spamming. I know what kind of pins I am looking for so, it is much faster. The benefit of Tailwind is the tribes feature, which is like group boards. And I like the ability to find different pins than what I get in my feed. Otherwise, I prefer manual pinning. I always hit this site at key times in my pursuit of learning how to blog and implement a social network strategy. Pinterest has been a thorn in my side. I really need to use Pinterest effectively to grow my foot print. As I believe in the world of Interiors, Pinterest is where you need to live. What are you thoughts? Maybe it’s just me, but scheduled Manual Pinning is the way to go. Thank you for explaining the critical steps necessary. Hi Jim and welcome back! Pinterest is just another blogging skill that gets easier the more you do it. Once your pin templates are set up, and you can work Canva more quickly, you can move on to other things. New bloggers or people new to Pinterest can get by with manual pinning, and because Pinterest knows that you are not using a tool – that you are actually on site and using the platform – and I believe they reward you with moving your pins up the feed and showing your pins more often to others. I read this in the Manual Pinning book and I have been testing it and I think it is an accurate assessment. The important thing with manual pinning is to be consistent. Pinterest rewards consistency. Thanks, Irma, for this really helpful post. I am currently growing my blog and diving into pinterest at the same time. I really do need simple things to help me – since I am still new to all the tech aspects of having a blog. Manual pinning would really help me in the aspect of not having to learn yet another program. I already signed up for Kyla’s free better pins challenge! I am excited to see how this affects traffic to my blog! Hi Andrea, and you will love that challenge! I know I did. Kyla makes amazing pins and is such an inspiration!! You get great tips on how to find your own style as well. I just love it and I think it is one of the better free challenges that I have tried. Hi Irma, I came across this post at a great time as I am in the process of understanding Pinterest and am doing lots of training for it. It’s quite a hard platform to figure out, for me at least, but I’m getting there. s this different to what you are talking about in your post. And is the $39 a monthly payment or yearly? Any extra info you could give me would be great ad I’m a newbie to this and want to find the very best way of moving forward with using up unnecessarily time (which I don’t have). The price for the Manual Pinning Simplified is a one-time pay. You get free updates for life. This is an affordable way to go if you are new to pinning and Pinterest for business. Even just winging it and doing your own manual pinning is a better way to go until you get a supply of pins pointing to your website to share. New pinners do not need Tailwind yet. 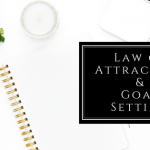 You should get set up with group boards and have a supply of pins, and this way you can use the time of your trial period to get things set up and get used to the system. As well, you need a lot of pins of your own to make it work for you. There is no point in paying for a tool that is sharing other peoples pins. On the other hand, Tailwind Tribes are very effective. If you are signed up for the free Tailwind trial, find 5 Tribes in your niche. Look for tribes with good engagement. Pin one of your pins into a tribe every day. You only get 30 pins per month on the free trial, but this is enough to start judging the effectiveness of any tribe you belong to. Divide up your 30 into 5 tribes = 6 each. So pin 6 pins into one tribe (one per day), then move on to the next tribe and monitor your traffic. Do this for a month or two and watch your analytics. 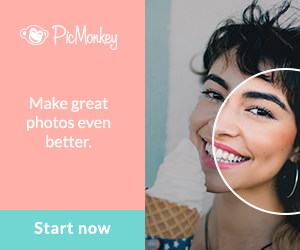 You can repin all the pins you want (from what I remember about the free account) from the tribes to your Pinterest profile and they do not count against you, but you can only pin into the tribes 30 times per month. Hi Irma, thanks for your reply, you have really given me a lot to think about. I will indeed check out tailwind and see how it works for me. And the one time payment for the Manual Pinning Simplified seems like a bargain, I will for sure do this once I get a handle on things. Awesome Stefanie, but the most important part is getting started with Pinterest. It takes time to get things set up and to gain followers and to load up your boards with pins. You will see growth, but it is slow in the early days. I encourage everyone to at least get set up with a business account on Pinterest and get Canva and start playing around with it and over time you will see success! I start to use Pinterest in my business two weeks ago and I found there is a lot to learn about it. Hi Tahani and welcome back! Yes, that is why I was happy to stumble onto this system. I find it to be a simple and straightforward system and you can learn it in an hour or so.